Yamaha P60 digital piano review. Guide to choosing a Yamaha P60. If your list of requirements is very long, don't buy the P60. If you're after features such as a built in drum machine, a built in sequencer, lots of sounds, and the ability to adjust the sensitivity of your digital piano's action, this digital piano would leave you crying in a corner. If you need lots of inputs, I'm sorry. The Yamaha P60 only has an input for a sustain pedal. Other Yamaha digital pianos would do a better job. 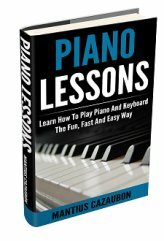 However, if all you need is a digital piano with 88 keys, a light weighted action that is not too far from that of an acoustic, and an excellent piano sound, you've found it. After all, a grand piano doesn't have all the technical features we mentioned above. I believe that the P60 is worth the price. You're only paying a little over $700 so you can't expect to get something in the class of a P250. The piano sounds are quite good, better than the P80 (in my opinion). As far as I'm concerned, the main reason why one should buy this digital piano is for the keyboard (88 keys, Graded Hammer action) and the piano sounds. Also, if you need a good practice instrument, it would be a good choice. When compared to other brands that sell digital pianos of the same price range, I believe that the P60 stands out. If you're on a tight budget, but you still want a fairly good digital piano, then go for it. The Yamaha P 60 is a basic Yamaha digital piano which does the job. Click here to shop for a newer Yamaha digital piano model. What you like about this keyboard. : The price was great considering the overall package. Excellent feel of keys and action. 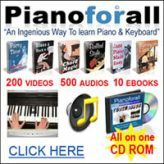 Excellent piano samples compared to most other name brands. Music rest included-bid plus!! What you dislike about this keyboard. : No line outs, bass end of piano is too loud and covers up music, F6 & G6 have no sustain sample, some notes are clearly generated poorly compared to the note beside it. Further comments on this keyboard. : This was a good purchase, and still a much better deal than the (cheap made) replacement P70-which feels cheap. Overall great sound and feel just a few little bugs. I would still recommend this piano to anyone! Return from Yamaha P60 review to Yamaha digital pianos page.